Drama Works! has been reviewed and approved by the Texas State Board of Education as the new textbook in creative drama and theatre arts for the state of Texas (details). Since 2015, Ddrama Works! has been adopted in dozens of districts and we have trained hundreds of teachers (theatre K-12, elementary generalists for arts integration, and elementary music teachers) how to get the most out of the digital and print components. We can offer you free consultations to take advantage of our experience and help you put together a package of licensing and PD teacher training services. Drama Works! is created from and aligned with state and national standards in arts and literacy, including the NCCAS national arts standards, Common Core ELA, Texas TEKS for theatre, and California VAPA standards. Drama Works! 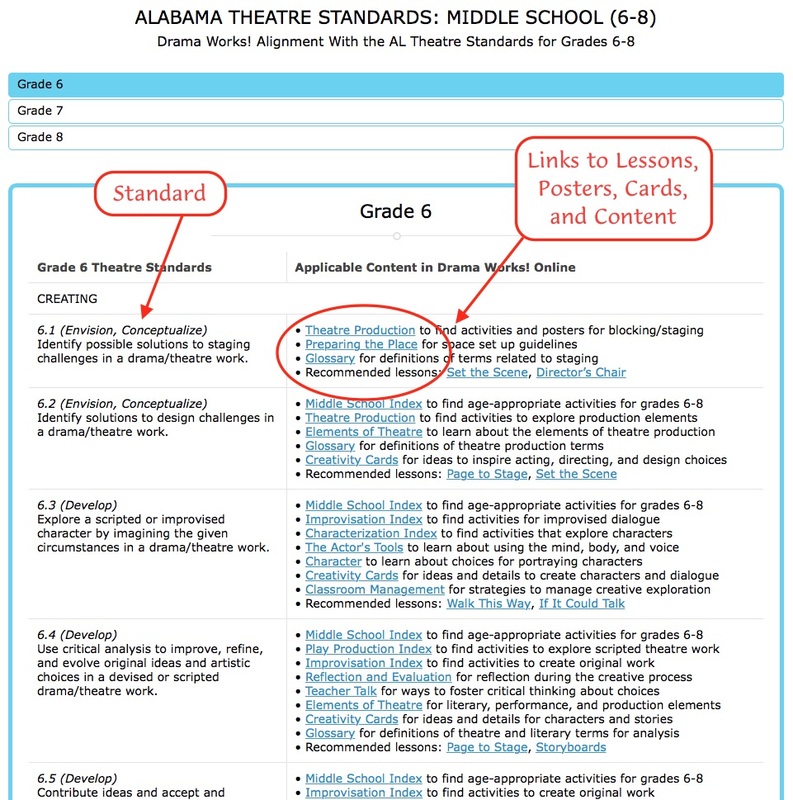 Online now includes a detailed alignment to the Alabama theatre standards for grades K-12. It is a non-traditional textbook in that you do not need to purchase books for every student, just one set per teacher. Ours is a dynamic teaching system that combines digital and print components to reach visual, auditory, and kinesthetic learning styles. 2018 is the year for fine arts textbook adoption in Alabama. Instructional Materials Allotment (IMA) funds will be made available from the state this year only for the purpose of purchasing fine arts textbooks including for theatre arts. Alabama has no theatre options on the state-reviewed list of fine arts textbooks. We did not submit for this review process in Alabama, however you can choose to use your IMA funds to purchase Drama Works! Teaching System as a textbook for teaching theatre, English, or arts integration in the elementary classroom. Adopting Drama Works! represents a substantial savings over traditional textbooks because you do not have to pay for books for every student or purchase class sets. Our pricing is per teacher and each Single Teacher License includes use by all of that teacher's students at no extra cost. In addition, each district-purchased license can be reassigned to a new teacher taking over for an outgoing licensed teacher at no extra charge (by changing the user information and password). To simplify the process, we offer 3 package choices. Pricing is per teacher (see Price List). Explore the tours and samples of the digital and print components available on our website to decide which package suits you best. All 3 choices include an extended digital access option that lasts through school year 2023-2024. - Each license will be valid for the full adoption cycle through school year 2023-2024 (no need to pay for annual subscription renewals). School or district volume orders, textbook adoptions, and extended digital access options for Alabama adoption are not available online and we do not accept credit card payments for such orders. We do accept purchase orders. Shipping/handling will be based on quantity and weight. We do not charge tax for orders outside of California. Step 2: Have your office or purchasing department send us all required paperwork to become a vendor for your school district. Step 3: Send us your official purchase order with correct totals (PD services may require a separate PO and contract). Step 4: We ship you print components and you choose a Login Administrator to oversee the teacher login credentials. Step 5: We setup login credentials and send them to the Login Administrator who distributes them to each licensed teacher. Step 6: We send you the invoice for payment due and you send us the check for payment. Step 7: We work together to schedule any agreed upon teacher training services. Drama Works! Online includes a section for Standards Alignments that is only available to licensed users after login. 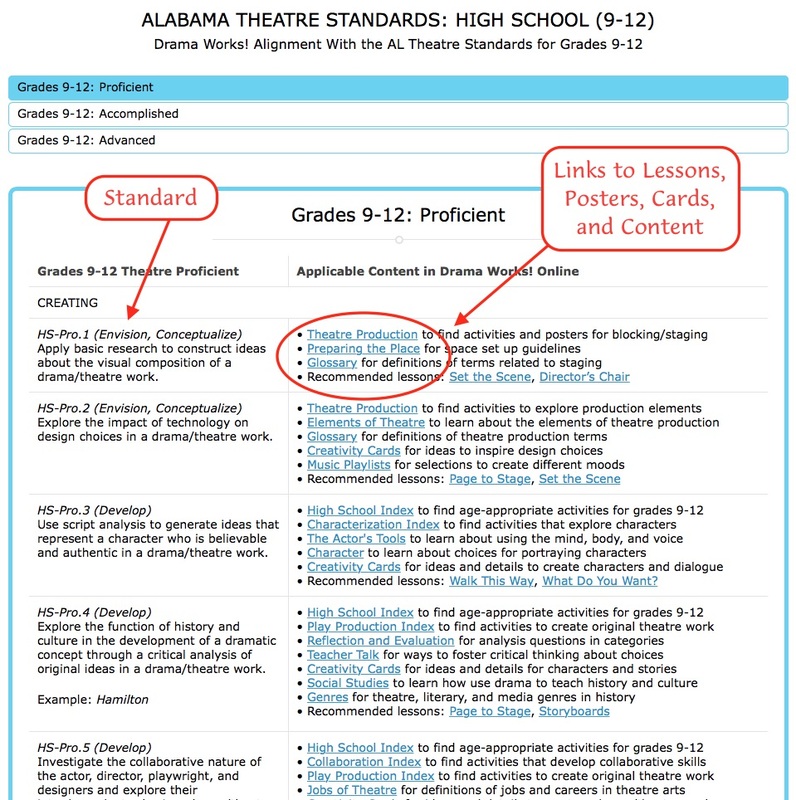 We have added a detailed alignment to the Alabama theatre standards for grades K-12. 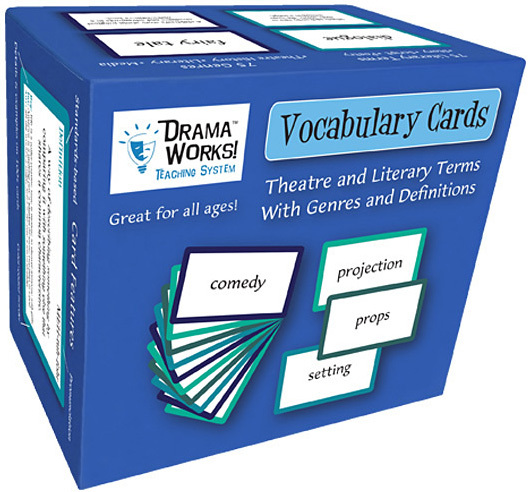 Note that the Standards Alignment is only available in the digital component (Drama Works! Online) and not the print components (Companion Book of Lesson Plans, Creativity Cards, and Vocabulary Cards). Below are sample views of Drama Works! 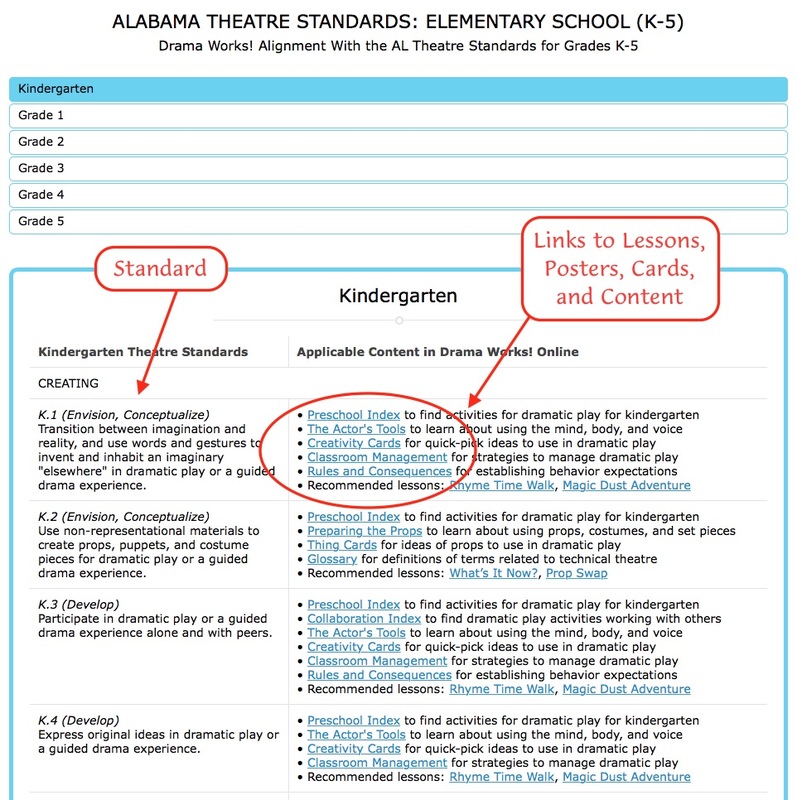 user-friendly Alabama standards alignment pages, which are located under Standards Alignments after logging into Drama Works! Online. The screenshot sample shows a basic view of the layout, and the complete alignment shows the full layout for all standards and grade levels (links and navigation anchors will not function in these samples, but do work for licensed users when logged in to Drama Works! Online). 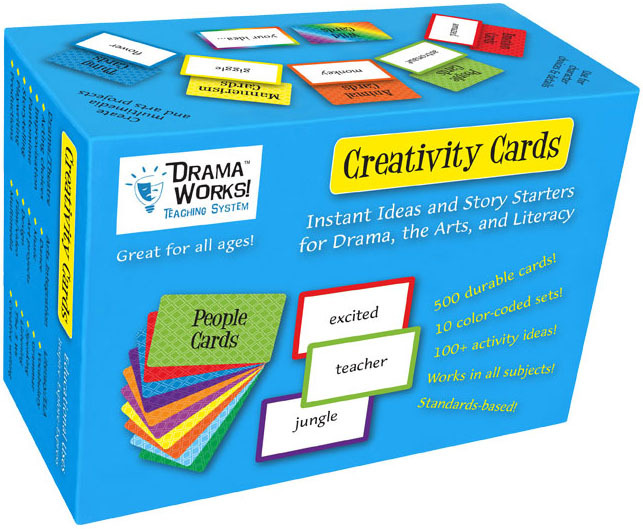 Take advantage of our Staff Development services to help teachers learn how to use Drama Works! Teaching System to meet the Alabama theatre standards and enhance learning across the curriculum with arts integration. 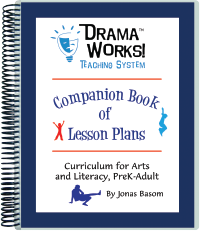 Learn directly from Mr. Jonas Basom, the author and creator of Drama Works! and award-winning teacher, professor, and arts education consultant. Contact us for a free consultation to help you design an effective PD plan for teachers in your school/district. 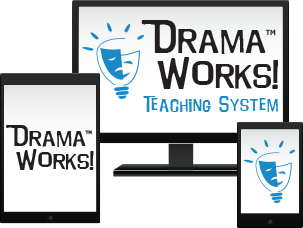 Our website statistics show that teachers who participate in our PD trainings are 5x more likely to login to Drama Works! Online than teachers who received materials but no PD training.